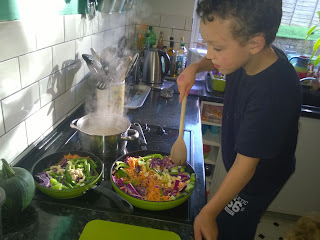 The Maz Shack (#2): Differentiated dinners - is it OK to cook separate meals? Differentiated dinners - is it OK to cook separate meals? 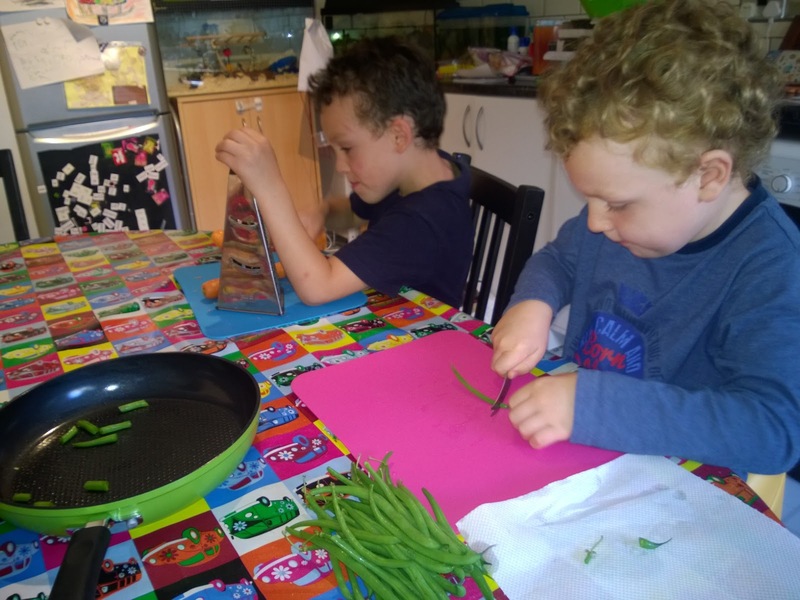 The boys love to prepare meals and are really unfussy most of the time, embracing all sorts of savoury flavours such as olives, sauerkraut and pickled seafood. The only real bone of contention when it comes to meal times is hot spicy food. Matt loves it, 3 year old Toby and I like very mildly hot spice, but 5 year old Ollie can't bear it at all. Even a whisper of pepper or chili near his food sends him running crying for water and causes complete meal refusal. So we had resorted to spicing Matt's food by chopping raw chilli peppers from our garden over the top of his food. It occurred to me this week however to slacken my general house rule of 'one meal, eat it or get plain bread and butter'. Our gorgeous new Ozeri Green Earth ceramic non-stick pans came in different sizes and it seemed simple enough to portion off some of our stir fry into the smaller of the two for Matt, to which I added two nice big chilli peppers for him. Fruit is to Matt what chilli is to Ollie, so it also meant that I could add sultanas to our big stir fry pan without spending the meal watching him pick bits out of his dinner. I don't think I have the patience to spend time cooking completely separate meals for different family members, and if we have guests who have something they can't eat, for example because they're vegan, we just make food that everyone can enjoy together. However, having a smaller pan in which slight tweaks can be made to food which has already been prepared for the big pan was something that proved useful. I know people can have really strong opinions on any household issues, so it would be interesting to see how you guys feel about cooking separate dinners. Do you do it? What are the reasons? Is it working well or a big extra chore? I'm always interested to see a point of view from the other side. Stir fry on a medium heat (if in an Ozeri pan, a bit higher if in a wok) until it is cooked how you like it (some like a stir fry almost raw, others prefer a softer texture). Serve with quinoa cooked as indicated by pack instructions and drizzle with a little sesame oil. There's not a lot of extra strong flavours in this one, such as ginger or lemongrass, because leaving them out allows the milder flavours of the fresh veg to star, and the little drizzle of sesame oil is surprisingly strong. I add it after cooking to prevent fouling the pans with oily residues and because sesame oil doesn't really like being heated too much - it changes the flavour in my experience. Safety: Toby is using a small cheese knife, which while just sharp enough to chop beans, is small and has a two-pronged edge which I feel makes it slightly less hazardous than a standard paring knife. A pair of childrens scissors is a safer option for small hands. Both boys are closely supervised while using knives or the grater. I took my hand off the pan handle to take the photo of Ollie, but as he is stood on a low kitchen step stool I keep one hand on him and one pan while he stirs in case he slips. Of course use your own knowledge of your kids to decide when they are ready for sharp or hot kitchen tasks and err on the side of caution if you are not confident that they are ready for a task, but I have started letting Ollie have a little bit of a stir while under very very close supervision. We don't let the boys near boiling water or ultra hot things like jam making though as these are really very dangerous. Note: I was sent the Ozeri Pans (full details below) to review for another site, but I liked them so much I mentioned them in this post too. Details from the packaging: Ozeri Green Earth Pans, 26cm and 20cm diameters, with Greblon(R) PTFE and PFOA free ceramic non-stick coating. Patterned cooking surface helps prevent food bonding for superior non-stick performance and easy cleaning. Induction stove safe. Scratch resistant durable ceramic coating. Comfortable silicone handle.